„Siebenbürgen, Land des Segens“, in English „Transylvania, land of blessings“, is a Transylvanian Saxon folk song also known as the “Siebenbürgenlied” (Transylvania-song) from 1856, which romanticises the region, traditionally inhabited by Germans, Hungarians and Romanians, as a “green cradle of a colourful flock of peoples”. 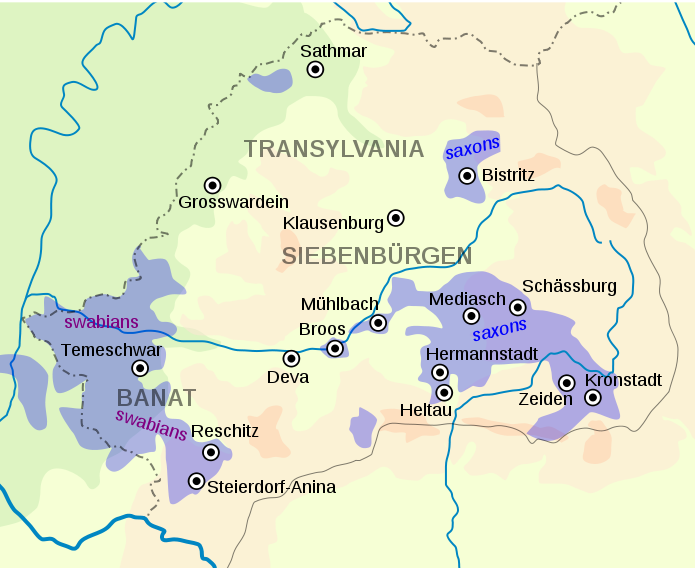 The German inhabitants of Transylvania in a broader sense, including the region of Banat, belong to two groups: Swabians and Saxons. The former settled in the region of Banat around Temeschwar (Timișoara), while the latter settled in the region of Transylvania proper in and around Hermannstadt (Sibiu), Schäßburg (Sighișoara), Kronstadt (Brașov) and Bistritz (Bistrița). The first German settlers arrived in Transylvania proper on the invitation of the Hungarian king Géza II between 1141 and 1161. Despite their name, the Transylvanian Saxons did not come from the territory of today’s Saxony, but from the regions of Niederrhein and Flanders, among others. The Banate region was only populated by German settlers in the 18th century, who arrived from Alsace, Bavaria and the Palatinate, among others. The 20th century and its two world wars, however, radically changed the political, cultural and demographic landscape of Transylvania. After the First World War, the Treaty of Trianon (1920) detached Transylvania from the Kingdom of Hungary, to which the region belonged, with some changes in its political structure, since 1000, and attached it to the Kingdom of Romania. In 1940, the Second Vienna Award, arbitrated by Nazi Germany and Fascist Italy, reattached Northern Transylvania to Hungary; a decision that was formally annulled by the Paris Peace Treaties in 1947. The world wars did not only change the political borders, but also the region’s cultural and demographic structure. The Shoah led to the destruction of the Jewish communities of Transylvania, with German-occupied Hungary deporting 131,641 of Northern Transylvania’s 165,000 Jews to concentration camps in 1944. The majority of Southern Transylvania’s Jewish population (40,937) fled the region after atrocities perpetrated by the Romanian “National Legionary Government” and the expulsion of Jews under Ion Antonescu’s regime (1940-44). The aftermath of the Second World war brought political chaos to Romania, with the Soviet Union occupying the country, carrying out vindictive policies against ethnic Germans in the region, with the Soviet “Order 7161” sealing the fate of many Transylvanian Germans. Romania’s German population, which numbered 740,000 in 1937, and was predominantly settled in Transylvania, began its exodus during the Second World War. In 1939-40, Hitler started the “Heim ins Reich” (“Back home to the Reich”) campaign, with the objective to relocate German populations living outside the territory of Nazi Germany, such as Transylvanian Saxons and Banat Swabians, to Nazi Germany. Due to the “Heim ins Reich” propaganda, and Hitler’s population transfer agreement with Romania, the German population fell to 470,000 by 1940. However, the majority of the local German population, around 420,000 people, stayed in Transylvania until the end of the Second World War. They faced the Soviet “Order 7161”, which foresaw the deportation of all German men aged 17-35 and German women aged 18-30 to labour camps in the USSR. According to estimates, 10% of deported Germans never returned to Romania. During Romania’s communist dictatorship, the Federal Republic of Germany was willing to pay Romania to allow for the emigration of up to 11,000 Transylvanian Germans every year to West Germany, starting in 1968. This led to a further drop in Transylvania’s German population, with the Romanian revolution of 1989 and the following democratisation leading to the largest wave of emigration, especially among young Germans. By 2013, the number of Transylvanian Germans has shrunk to only 38,000. Today, the memories of Transylvanian Germans live on in literature, in folk songs, and also at cultural events in both Transylvania and Germany. The post-Communist breakthrough in the recognition of the sufferings of Transylvanian Germans happened in 1995, at the fiftieth anniversary of the deportations, as commemorations took place both in Kronstadt (Brașov), Transylvania, and in München (Munich), Germany. Ion Iliescu, Romania’s president at the time, and Nicolae Văcăroiu, the country’s then prime-minister, “sent their official messages to the participants, thus acknowledging the suffering of Romanian Germans”. Furthermore, in 1997, the country’s then Minister of Foreign Affairs, Adrian Severin, officially apologised to his German counterpart. These gestures led to the memoralisation of the deportation of Transylvanian Germans, being acknowledged both within and outside the German community. The deportation of Transylvanian Germans shifted into the global literary spotlight with Herta Müller’s novel “Atemschaukel” (“The Hunger Angel”) in 2009. Müller, a Banat Swabian from Nitzkydorf (Nițchidorf) who emigrated to West Berlin in 1987, describes in her novel the sufferings of a 17-year old German who is deported to a labour camp in the USSR, based on the experiences of both the renowned Transylvanian German poet Oskar Pastior, and the author’s mother. “Atemschaukel” gained widespread acclaim, which culminated in Müller receiving the Nobel Prize in Literature in 2009. Furthermore, events such as the “Sachsentreffen” (Saxon meeting) are vital to the preservation of Transylvanian German memory and identity. The Sachsentreffen of 2017, which was held in Hermannstadt (Sibiu) under the motto “In der Welt zuhause, in Siebenbürgen daheim“ (At home in the world, “truly at home” in Transylvania), was also attended by Romania’s first ethnic German president, Klaus Iohannis (elected in 2014). Klaus Iohannis, who served as the mayor of Hermannstadt (Sibiu) from 2000 to 2014, delivered a speech in both Romanian and German at the event, mentioning the deportation and discrimination of Germans after the Second World War in his speech. Germans have been an integral part of Transylvania’s cultural, political and demographic landscape for centuries, shaping the once uniquely diverse region. Today, the Transylvanian German population has fallen to only 38,000, endangering the future of Germans in the region. Nevertheless, events such as the Sachsentreffen, literary successes such as Herta Müller’s Atemschaukel, and political pronouncements of Romania’s politicians have contributed to the preservation of the memory of Transylvanian Germans in Romania, and the global recognition of the community’s history in the heart of the Carpathian Mountains.